Wait! Wait! I know what it is. Welcome back. 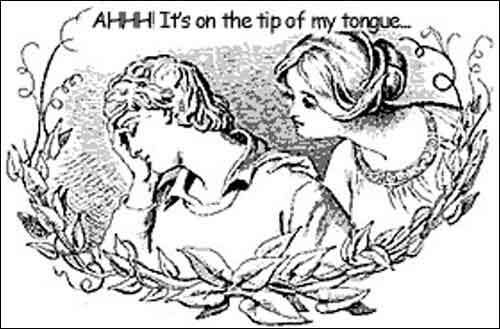 Do you ever experience tip-of-the-tongue lapses, when you just can’t recall a word you know? By the time you reach my age, you’ve learned so many words, it can be difficult to remember them all as quickly as you’d like; but there’s more to it. An international team led by researchers from the UK’s University of Birmingham demonstrated that, while cognitive abilities decline with age, aerobic fitness can reduce those tip-of-the-tongue occurrences. Before describing the study, I’d better point out that tip-of-the-tongue states are not a memory problem; they’re not associated with memory loss. They indicate a disruption in the two-stage process of retrieving the word meaning and phonology (sound form representations). To investigate the relationship between aerobic fitness and tip-of-the-tongue states, the researchers had 28 healthy older adults (20 women, mean age 70; 8 men, mean age 68) complete an aerobic fitness test and a language experiment, and 27 university students (19 women, mean age 23; 8 men, mean age 23) complete the language experiment only. 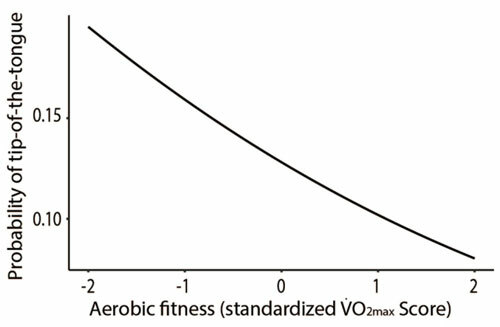 To measure aerobic fitness, the older participants did stationary cycling (a graded, sub-maximal aerobic fitness test on a cycle ergometer) to estimate maximal oxygen consumption (VO2max, where V - volume, O2 - oxygen). 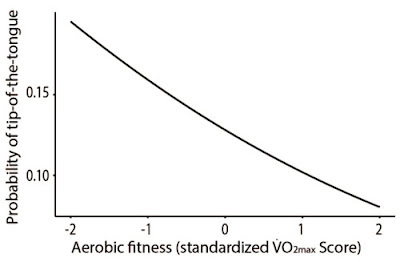 VO2max is the maximum amount of oxygen a person can utilize during intense exercise. For the language experiment, young and old participants completed the same computer-based, definition-filling task. The participants were presented 60 definitions or questions in random order (20 definitions of low frequency words, 20 definitions of easy words and 20 questions about famous people). Example definitions, target words and foils if participants experienced a tip-of-the-tongue (from www.ncbi.nlm.nih.gov/pmc/articles/PMC5928071/). If participants indicated they experienced a tip-of-the-tongue state, they were asked to provide three pieces of information about its sound: (1) the initial letter or sound; (2) the final letter or sound and (3) the number of syllables. Finally, participants were asked to select the target word from a list of four words displayed on the screen or to indicate that the word they were thinking of was not in the list. The data were analyzed using mixed effects models, an extension of linear regression models. 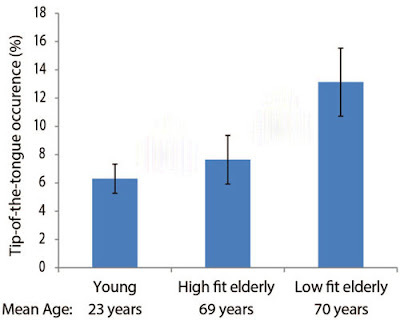 In addition to comparing older with younger participants, the researchers performed a median split on the standardized aerobic fitness scores to generate a high-fit older adults group and a low-fit older adults group. 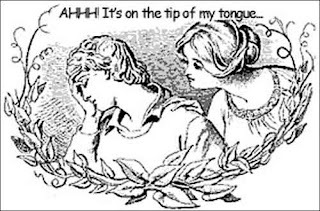 The key findings were that older adults experienced more tip-of-the-tongue occurrences and had less access to phonological information than did the younger participants; however, the more aerobically fit the older adults were, the less likely they were to experience a tip-of-the-tongue state. The probability that older adults experienced a tip-of-the-tongue decreased as aerobic fitness increased (from www.ncbi.nlm.nih.gov/pmc/articles/PMC5928071/). The tip-of-the-tongue occurrence of high-fit older adults was lower than that of low-fit older adults and not much higher than that of young adults. Tip-of-the-tongue occurrences of young, high-fit elderly and low-fit elderly participants on language experiment; error bars represent standard error of the mean (from www.ncbi.nlm.nih.gov/pmc/articles/PMC5928071/). The study also found that young and older adults both experienced fewer tip-of-the-tongue occurrences the shorter the target words (as measured by the number of phonemes) and the larger their vocabulary size. Notably, older adults had a significantly larger vocabulary than young participants. Overall, the study demonstrated that there is a relationship between language production abilities and aerobic fitness in healthy older adults. The higher the older adults’ aerobic fitness level, the lower the probability of experiencing a tip-of-the-tongue. The results further support increased physical activity for healthy aging and optimal brain function across the life span. Go for it!